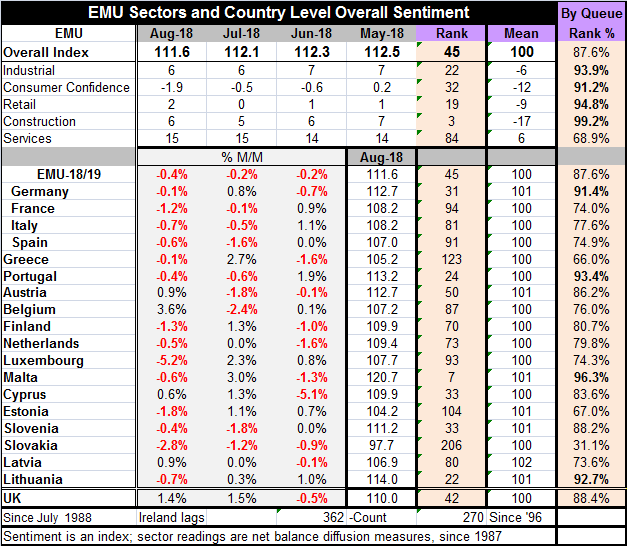 EMU Confidence Slips...Are Policy Risks Rising? The plot in the chart makes it clear that the slippage in the EU indexes for EMU members is an ongoing phenomenon, not a one-month or two-month bit of variation. This sort of slippage is confirmed as well by the Markit indexes that had been eroding from their recent peaks. The EMU index fell to 111.6 in August from 112.1 in July, slipping to an 87.6 queue percentile standing on data since 1988. All of the sectors on an EMU-wide basis have queue percentile standings in the top 10% of their respective queues of data, except for services where the standing is much lower in the 68th percentile of its historic data queue (top 32%). Still, this service sector reading is solid; the rest of the reading are especially strong because of the fact that they are all doing so well together. That is a rather spectacular assessment of performance in the euro area: the breadth of strength. Even so, all the gauges are slipping at the same time. All of them are off their recent peaks and losing momentum. There are 19 members of the euro area and 18 of them have reported their data for August. Of these eighteen, only four show month-to-month gains in their respective overall economic sentiment indexes this month. It is surprising that so many members can show weakness and yet the overall gauge falls so little month-to-month. All four of the largest EMU member economies slipped m/m in August: Germany by -0.1%, France by -1.2%, Italy by -0.7%, and Spain by -0.6%. In the month, the overall EMU gauge fell by only 0.4%. The mitigating gains were made largely in smaller economics: in Austria 0.9%, Belgium 3.6%, Cyprus 0.6%, and Latvia 0.9%. The monthly losses that were so widespread follow drops in eight members in July and nine members in June. Of course, these results are appearing at time that the ECB is looking to withdraw its stimulus. Central banks cannot be stimulative forever. And economic history teaches us that excessive stimulus leads to bad events or results. While the EMU economy clearly is coming off the boil, its pace of growth is still solid and the ECB is looking for the right time to begin to remove the props from under the economy. Unfortunately new risks and challenges continue to emerge out of the woodwork like cockroaches in a lower east side Manhattan apartment. Italy already has flaunted some international standards by refusing to take immigrants for asylum from boat rescuers in the Mediterranean. This is a sticky issue. But Italy already has absorbed so many migrants, as has Greece, that the new government has finally said ‘enough.’ It is acting as it is to pressure the EU to take a bold step and to harbor new migrants elsewhere and share this burden. While Angela Merkel has given lip service to the burden borne by Italy and Greece by being the ports of first entry where by EU rules say migrants must stay until they are vetted for acceptance somewhere in the EU, the rules do not get modified. EU leaders have done nothing to relive the strain on Greece and Italy. Germans already are in revolt over the immigrants they have absorbed to date and certainly ‘Germany’ does not want to take ‘more’, ‘faster’, or even ‘some’ on a temporary basis. Basically, the EU has set itself up and claimed the high moral ground and left Italy and Greece in the low-lands to slug it out with the economic realities of this situation. Migrant issues continue to tear at the fabric of ‘unity’ in the EMU/EU. And if anyone is paying attention, this was the most important reason that the U.K. left the region to regain control of its own borders. Ejecting the U.K. (well not rejecting, actually, but by not agreeing to some compromise and letting a vote on an exit referendum that was approved the EU had a missed opportunity) will go down as huge mistake by EU members and leaders. The U.K. succession will probably be blamed more on the U.K. leaders for allowing a referendum (How DARE you ask ‘the people’ what they want?? ), but in fact, Europe already has this rift and it is trying hard to ignore it. Losing the U.K. as a member over a problem it refuses to fix is stupid. Europe has a policy problem in which its leaders want to do ‘the right thing’ but do not want to bear the consequences of it and ‘the people’ do not want it at all. This is sure to get worse before it gets better, especially as conditions in the Middle East and Africa continue to erode and spawn more migrants. Migrants have become a big global issue as the U.S. has been cracking down on migrants flowing in over its Southern border. South America is now beset with refugees from Venezuela since its economy has been imploding. Myanmar aggressively and illegally acted to rid itself of the Rohingya turning them into migrants as well. The UN today urged China to let the Uighurs out of internment camps. They are slightly different case, a domestic group that China fears will create unrest. There is no denying the impact of these sorts of tensions on the global economies. Angela Merkel’s stand in favor of allowing migrants in Germany cost her dearly in the last election and she now seems to be in the twilight of her once-dominant career. Politics always has influenced economics and vice versa. In addition to migrant issues, there are many geopolitical hot spots that could blow up and become factors. Syria is far from settled down. The risks to the economy from ‘outside economics’ are still substantial. The economies of the euro area at the moment are almost on automatic pilot with Italy as a wild card. Even with the area’s growth cooling, the ECB is going to gradually pull the plug on stimulus. Meanwhile, a lot of factors lurk in the wings that could make that process less-than-smooth going. Globally, central banks have decided that it’s time (or about time) to take the foot off the accelerator. We should all watch closely to see what is going to happen. Since low interest rates have not been able to spur more growth and have not been able to stoke inflation, will the slow reversal to higher levels have an impact or have we entered some kind of economic twilight zone in which interest rates just do not matter as much as they once did?